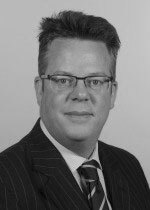 Mr Peter Valentine has been a Consultant ENT Surgeon for over 10 years, specialising in ear surgery & the treatment of balance disorders. After surgical training in London at the Royal National Throat, Nose & Ear Hospital, he was awarded the Graham Fraser Foundation Fellowship in Otology & Cochlear Implantation to study in Sydney, Australia where he developed an interest in the treatment of Meniere’s disease and paediatric hearing loss. Mr Valentine is on the faculty of ear surgery courses in London, Cambridge and Manchester. He is currently President of the British Balance Network and is on the Council of the British Society of Otology. Mr Valentine is married with twins - a boy and a girl. He is passionate about cooking and tries to play golf. Mr Peter Valentine does not hold a share or financial interest in this hospital, another Nuffield Health hospital or the company. Mr Peter Valentine does not have a share or financial interest in equipment used at this hospital or another Nuffield Health hospital. Mr Peter Valentine does not hold any paid advisory role(s) at this hospital or on behalf of Nuffield Health.